Alzheimer’s disease, Tau, Glycogen synthase kinase-3β, Phosphatidylinositol-3-kinase, Threonine-serine protein kinase B.
Alzheimer’s disease (AD) is a chronic neurodegenerative disease characterized by a progressive cognitive impairment and memory impairment. The main pathological features are deposition of Senile Plaques (SP), Neurofibrillary Tangles (NFTs), and apoptosis of a large number of neurons . The incidence of AD has been increasing, and it is estimated that there would be 100 million patients of AD worldwide in 2050, which would bring a heavy burden on the patient’s families and society . Therefore, the development of safe and effective drugs that prevent and treat AD is of great practical and social significance. Due to the complex causes of AD, the scientists put forward a variety of hypotheses according to the pathology and characteristics of AD, such as the Aβ toxicity theory, tau protein theory, oxidative stress theory, and so on . The accumulated evidence has shown that the aqueous extract of Curcuma wenyujin has antioxidant stress effects, allows antidepressant blood circulation, etc., . Our previous study had shown that that an aqueous extract of Curcuma wenyujin can improve the cognitive function in Aβ25-35 Intracerebroventricularly (ICV)-injected mice . This study further investigated its mechanism on this basis. Aβ25-35 was purchased from Sigma-Aldrich. Donepezil, with purity higher than 98%, was obtained from Eisai, Ltd. The aqueous extract of Curcuma wenyujin was provided by the Medicinal Herbs Corporation of Bozhou, Anhui Province, and was identified as authentic the aqueous extract of Curcuma wenyujin by You Xianmin, who is a professor of Chinese Medicine Research Institute of Liaoning Province. Page-Ruler prestained protein ladder (10-170 kDa) was purchased from Thermo Fisher Scientific Chemical Reagent Co., Ltd. The BCA protein assay kit, Sodium Dodecyl Sulphate Polyacrylamide Gel Electrophoresis (SDS-PAGE) preparation kit, and SDS-PAGE sample loading buffer (5x) were obtained from the Beyotime Institute of Biotechnology. Antibodies against tau-5 were obtained from Invitrogen Biotechnology, Ltd. Antibodies against thr 231, thr 181, ser404, anti-phospho-AKT1+AKT2+AKT3 (thr308+thr309+thr305) antibody, antiglycogen synthase kinase 3 beta (GSK-3β), anti-phospho- GSK-3β (ser 9), anti-phosphoinositide 3-kinase (PI3K) p85 antibody, and anti-phospho-PI3K p110 beta (ser1070) antibody were purchased from Bioss biological Co., Ltd. Akt1/2/3 Antibodies (H-136) was purchased from Santa Cruz Biotechnology, Ltd. β-actin was purchased from Beijing ComWin Biotech Co., Ltd. HRP-labelled goat anti-rabbit Immunoglobulin G (IgG; H+L), HRP-labelled goat anti-mouse IgG (H+L), and BeyoECL Plus (ECL-like Western reagent) were obtained from the Chinese Zhongshan Jinqiao Biological Technology Co., Ltd. Beijing. All other chemicals were of analytical grade. Preparation of the aqueous extract of Curcuma wenyujin: 1 kg of Curcuma wenyujin was soaked in 6000 mL water for 1 h, extracted at 100°C for 2 h, drug residues were extracted 2 times and every time with 1 h by water decocting method. The filters were combined and were dried at 70°C under reducing pressure, and pulverized into fine powder (119.77 g), which was the aqueous extract. Equal male and female Kunming mice (SPF), that weighed 20-22 g (n=48, 8 weeks in age), obtained from Liaoning Changsheng Biotechnology Co., Ltd. The mice were maintained under standard housing conditions (22°C ± 2°C and constant humidity 50% ± 5%), and light was given 12 h/d. Food and water were available ad libitum. The use of the experimental animals was strictly in compliance with the Chinese legislation and guidelines determined by the Experimental Animal Research Institute of Liaoning University of Traditional Chinese Medicine (131/2010; Approved on November 1, 2011). Aβ25-35 aging: Aβ25-35 was dissolved in sterile saline, and incubated at 37°C for 120 h. The mice were divided into six groups, each group had eight mice. The mice were weighed, and anesthetized by intraperitoneal injection of 3.5% chloral hydrate at 10 mL/kg. After that, the mice were fixed on a brain stereotaxic device using a mouse adaptor, the skulls were then exposedand a 2 cm incision was made on the midline of the skull. The bregma in the fontanel was used as the starting point to backward for 0.5 mm, and then a micro-injector was vertically penetrated to the depth of 3.00 mm, at a distance of 1.0 mm. Then, a 3 μL aggregated Aβ25-35 was slowly administered ICV, within 1 min, control group was injected with volumes of sterile saline. The needle was retained for 5 min so that the drugs can disperse. The mice were orally administered with the aqueous extract of Curcuma wenyujin (0.16-0.48 g/kg), donepezil (1.3 mg/kg) or vehicle by gavage following the second day after Aβ25-35 injection. The mice were dosed on a daily basis. The mice were deeply anesthetized with chloral hydrate (300 mg/kg i.p. ), and then fixed by 4% paraformaldehyde. Their brains were removed, and embedded in paraffin. Then, the brain was sliced with a slicer to 5 μm size slices. The sections were treated with diluted first antibody overnight 4°C. After washing, the secondary antibody was administrated at room temperature for 1 h, and then 3, 3’-Diaminobenzidine (DAB) coloring was performed. The staining process was carried out in accordance with a modified ABC immunohistochemistry procedure. The antibodies used for immunohistochemistry analysis included the tau (ser404) and tau (thr231) antibody. Images were acquired with an Olympus inverted microscope. One hour after the last administration, three mice from each group were extracted to be decapitated quickly; following this, the hippocampus was separated on ice, and weighed. The brain tissue was rinsed with cold PBS twice, and then disrupted with 400 μl of cold hypotonic buffer for 15 min on ice. The total protein was extracted from the hippocampus after being lysed by protein lysis buffer. The Bradford assay was used to determine protein concentration. Protein extracts measuring (50 μg) were separated with sodium dodecyl sulphatepolyacrylamide gel electrophoresis and were then electrophoretically transferred to polyvinylidene difluoride membranes. After incubation at room temperature with 5% non-fat milk in phosphate buffered saline (PBS) for 2 h, the membranes were incubated overnight at 4°C with the indicated primary antibodies against tau-5 (Invitrogen), ser 404, thr 231, thr 181, PI3K, p-PI3K, AKT, p-AKT, GSK-3β, p-GSK-3β, and β-actin. The membranes were then incubated with secondary anti-mouse IgG or anti-rabbit IgG antibodies for 2 hat room temperature. After washing again, the hypersensitive ECL chemiluminescence kit was added, and the expression of the relevant protein was observed by a gel imaging system. Analysis was performed by Quantity One 4.6.2 image analysis software. SPSS17.0 statistical software was used to perform one-way ANOVA for the experimental data. Fisher’s LSD was used to perform multiple comparisons, and expressed as mean ± SD. P<0.05 was considered statistically significant. Immunohistochemistry analysis showed that the number of ptau (ser404) and p-tau (thr231) increased dramatically in the hippocampi of the Aβ25-35-injected mice compared to the control group. However, compared to the model group, the increase of p-tau (ser404) and p-tau (thr231) by Aβ were blocked by aqueous extract of Curcuma wenyujin 0.48 g/kg and the donepezil 1.30 mg/kg treatment’s (Figure 1). 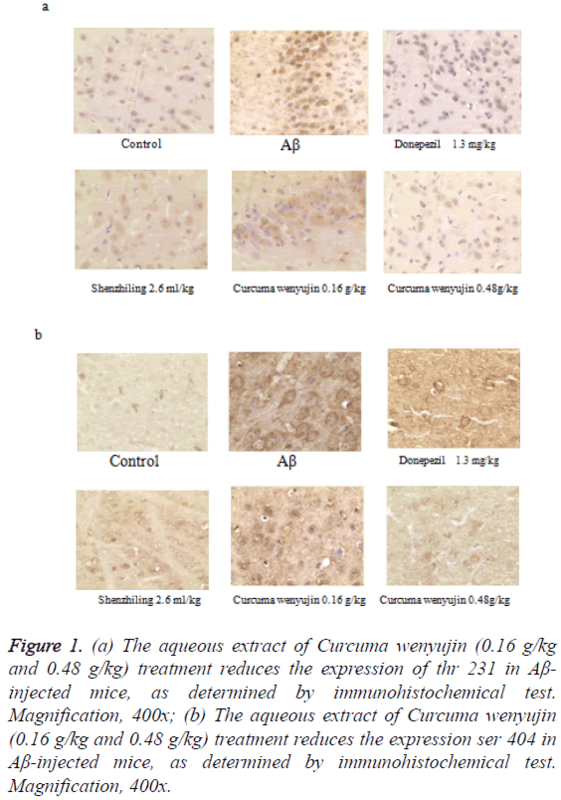 Figure 1: (a) The aqueous extract of Curcuma wenyujin (0.16 g/kg and 0.48 g/kg) treatment reduces the expression of thr 231 in Aβ- injected mice, as determined by immunohistochemical test. Magnification, 400x; (b) The aqueous extract of Curcuma wenyujin (0.16 g/kg and 0.48 g/kg) treatment reduces the expression ser 404 in Aβ-injected mice, as determined by immunohistochemical test. Magnification, 400x. Tau-5, a dependent antibody that recognizes both phosphorylated and non-phosphorylated tau forms, indicates a total amount of tau protein in the hippocampus tissue. Compared to the control group, phosphorylation levels of tau (thr231), tau (ser404) and tau (thr181) in mice of the Aβ group elevated significantly. However, the aqueous extract of Curcuma wenyujin treatment decreased the phosphorylation levels of tau (thr231), tau (ser404) and tau (thr181) in a dosedependent manner (P<0.05, Figure 2). Figure 2: (a) Effects of the aqueous extract of Curcuma wenyujin on the expression of thr 181, thr 231, ser 404 and tau-5 in the hippocampus. The aqueous extract of Curcuma wenyujin (0.16 g/kg and 0.48 g/kg) significantly decrease: (b) thr 231; (c) ser 404; (d) thr 181, as determined by Western blotting. All of the results are expressed as the means ± SD. n=3 animals; #p<0.05 vs. control; *p<0.05 vs. Aβ. We found that compared to the control group, phosphorylation level of the PI3K/AKT/GSK-3β signaling pathway in the Aβ group decreased significantly, while compared to the Aβ group, phosphorylation level of the PI3K, AKT, and GSK-3β in the aqueous extract of Curcuma wenyujin group increased (P<0.05, Figure 3). In this study, we confirmed that the aqueous extract of Curcuma wenyujin inhibited the phosphorylation levels of tau (thr231), tau (ser404) and tau (thr181), and the phosphorylation of PI3K, AKT, and GSK-3β were increased in mice induced by Aβ25-35. Our previous study had shown that aqueous extract of Curcuma wenyujin can improve the cognitive function in Aβ25-35 ICV-injected mice . 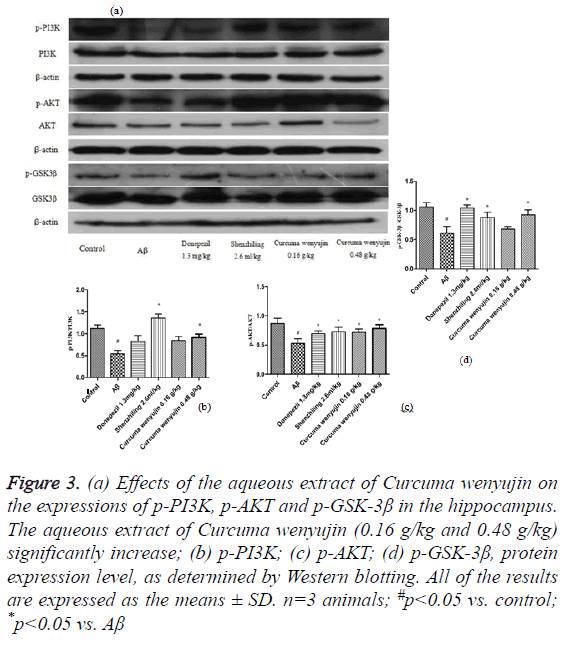 Together, these results suggest that aqueous extract of Curcuma wenyujin improves the learning and memory impairments possibly through the PI3K/Akt/GSK-3β signaling pathway. Donepezil, a cholinesterase inhibitor, is a representative symptomatic therapy for Alzheimer’s disease. Also, it has been reported that donepezil could reduce phosphorylated tau levels by Western blot analysis, as well as an immunohistochemical study. Donepezil treatment also inactivated GSK3β, which is one of the tau kinases, via the activation of Akt . So we keep using the drug in the paper. Curcuma wenyujin is a dry plant root of the turmeric genus . Previous studies had shown that Curcuma wenyujin is hypolipidemic, improves hemorheology, prevents depression and liver injury, prevents oxidative stress, and improves immune regulation . Since it promotes blood circulation and reduces oxidative stress, speculating form the pathogenesis of Alzheimer’s disease, Curcuma wenyujin may have a therapeutic effect on Alzheimer’s disease . At the early stage, we observed the effect of the aqueous extract of Curcuma wenyujin on the behaviours of model mice with Alzheimer’s disease. Our data confirm that the aqueous extract of Curcuma wenyujin can improve the learning and memory functions of AD model mice. This study mainly investigated its mechanism. At present, a large number of in vivo and in vitro studies have found that the increase in Aβ level in the brain of AD patients is significantly correlated with the decrease in cognitive ability . Therefore, Aβ25-35 had been injected into ICV to build the AD animal model. Tau protein is a microtubule-associated protein, and its hyperphosphorylation is one of the main pathological features of AD . Literatures have confirmed that tau protein is correlated with AD in the three phosphorylation sites of thr181, 404, and 231 . The current study suggested the aqueous extract of Curcuma wenyujin can reduce the phosphorylation level of tau protein in thr181, ser404, and thr231 sites induced by Aβ. This, in turn, possibly contributes to the improvement of Aβ-induced spatial learning and memory impairment. The decreased activity of PI3K/Akt signaling pathway can promote the high phosphorylation of tau protein, which is an important signaling pathway leading to neuronal apoptosis . The molecule GSK-3β on the downstream of the PI3K/AKT pathway is a key regulator of glycogen synthesis, and its activity decreases significantly after phosphorylation [13,14]. Abnormal increase in the activity of GSK-3β cans phosphor late tau protein at multiple sites . Therefore, we studied the effect of the aqueous extract of Curcuma wenyujin on GSK-3β and the changes in the PI3K/AKT pathway. Our studies have shown that the aqueous extract of Curcuma wenyujin increases the phosphorylation levels of PI3K, Akt and GSK-3β. These results suggested that the aqueous extract of Curcuma wenyujin possesses the ability to inhibit the over-phosphorylation of tau protein in AD mice induced by Aβ25-35. Thus, the aqueous extract of Curcuma wenyujin may be an efficacious and promising remedy for the treatment of AD because the therapeutic target of it is the PI3K/Akt/GSK-3β pathway. As a result, the aqueous extract of Curcuma wenyujin may become a promising drug for the treatment of AD. Zumkehr J, Rodriguez-Ortiz CJ, Cheng D, Kieu Z, Wai T, Hawkins C, Kilian J, Lim SL, Medeiros R, Kitazawa M. Ceftriaxone ameliorates tau pathology and cognitive decline via restoration of glial glutamate transporter in a mouse model of Alzheimer’s disease. Neurobiol Aging 2015; 36: 2260-2271. Chan KY, Wang W, Wu JJ, Liu L, Theodoratou E, Car J, Middleton L, MTCPsych TCR, Deary LJ. Epidemiology of Alzheimer’s disease and other forms of dementia in China, 1990-2010: a systematic review and analysis. Lancet 2013; 381: 2016-2023. Barage SH, Sonawane KD. Amyloid cascade hypothesis: Pathogenesis and therapeutic strategies in Alzheimer’s disease. Neuropeptides 2015; 52: 1-18. Motterlini R, Foresti R, Bassi R, Green CJ. Curcumin, an antioxidant and anti-inflammatory agent, induces heme oxygenase-1 and protects endothelial cells against oxidative stress. Free Radical Bio Med 2000; 28: 1303-1312. Yabin W, Kai K, Yue Q, Bingbing Z, Dong J. Radix curcumea extract on Alzheimer’s disease mice induced by β-amyloid (Aβ25-35). Chin Archiv Trad Chin Med 2016; 34: 2905-2909. Hamano T, Shirafuji N, Sasaki H, Ishi-da A, Ueno A, Yen SH, Yoneda M, Kuriyama M, Nakamoto Y. Donepezil reduces phosphorylation levels of tau protein in a cellular model of tauopathy. Poster Presentations 1: 305. Xiaoxiao H, Shilin C, Luqi H, Peigen X. Survey of investigations on Daodi Chinese medicinal materials in China since 1980’s. Chin J Chin Materia Medica 2009; 34: 519-523. Gukovsky I, Reyes CN, Vaquero EC, Gukovskaya AS, Pandol SJ. Curcumin ameliorates ethanol and non-ethanol experimental pancreatitis. Ajp Gastrointestinal Liver Physiol 2003; 284: 85-95. Reddy PH. Abnormal tau, mitochondrial dysfunction, impaired axonal transport of mitochondria, and synaptic deprivation in Alzheimer’s disease. Brain Res 2011; 1415: 136-148. Fujimura M, Usuki F, Sawada M, Takashima A. Methyl mercury induces neuropathological changes with tau hyperphosphorylation mainly through the activation of the c-jun-N-terminal kinase pathway in the cerebral cortex, but not in the hippocampus of the mouse brain. Neurotoxicol 2009; 30: 1000-1007. Tokutake T, Kasuga K, Yajima R,Sekine Y, Tezuka T, Nishizawa M, Ikeuchi T. Hyperphosphorylation of Tau induced by naturally secreted amyloid-beta at nano-molar concentrations is modulated by insulin-dependent Akt-GSK3 beta signaling pathway. J Biol Chem 2012; 287: 35222-35233. Wang YX, Yang RY, Gu Jl, Yin XM, Jin NN, Xie ST, Wang YF, Chang HH, Qian W, Shi JH, Iqbal K, Gong CX, Cheng C, Liu F. Cross talk between PI3K-AK T-GSK-3β and PP2A pathways determines tau hyperphosphorylation. Neurobiol Aging 2015; 36: 188-200. Jiang H, Guo W, Liang X, Rao AY. Both the establishment and maintenance of neuronal polarity require active mechanism: critical roles of GSK-3beta and its upstream regulators. Cell 2005; 120: 123-135. Mohan ML, Jha BK, Gupta MK, Vasudevan NT, Martelli EE, Mosinski JD, Naga Prasad SV. Phosphoinositide 3-kinase gamma inhibits cardiac GSK-3 independently of Akt. Sci Signal 2013; 6: 4.